Handy organizer for thr whole family! My wife has not fully entered the digital age and still uses paper. I got this for her so she doesn't have to use a paper calendar that just gets tossed at the end of every month. I really like the reusable Idea Calendar. We have it on the front door of our refrigerator where everyone in the family can see it and add to it as necessary. Now I can be more organized with this visible calendar! Love it! Really love to have my entire calendar view up on my fridge. 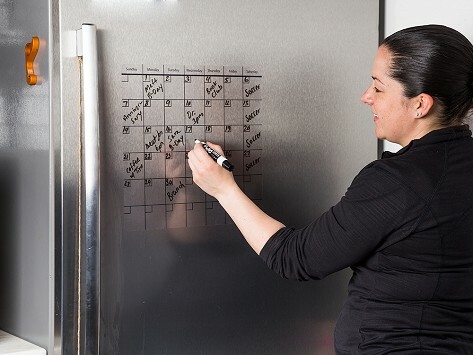 And the clear calendar looks great instead of the usual glaring white of a dry-erase board. I have gotten many compliments on it so far. I close the pocket door at night to keep my dogs from wandering so now I see my calendar first thing in the morning and nobody else ever sees it because they wouldn't think of closing that door. 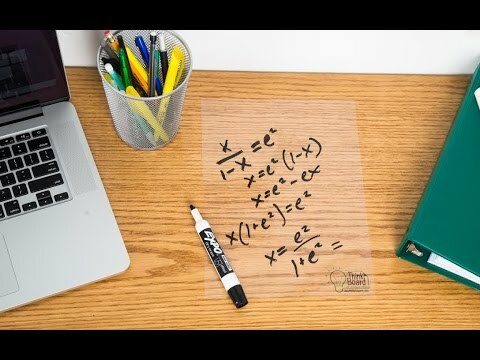 I love the idea, the privacy - I have the plain Think Board cut in half - using it on my glass drafting table saving me from having to keep a pad handy by, and on the inside of my office closet door. It works really well, doesn't distract at all, and is good looking as it fades into the background. I'm tempted to get one for my kitchen window. My fancy expensive fridge is not magnetic!?! Cannot hang anything on the fridge. This calendar is great as it sticks and easy to change month to month. I wish I was better at getting out all the air bubbles though. I found this very handy in our busy schedule. It is displayed in our hallway where we all pass. It does keep us organized. I choose not to remove the backing as the calendar would not display well against the wall color. I gave it 4 star because I did not receive the peel and stick corners. I used command poster strips to hold the calendar in place. Really like the calendar and have it on our refrigerator. It's way better than a little bulletin board, and looks very cool. However, it's not easy to install. Air bubbles and creases will be there. it's tricky to handle and seals so well if you have air bubbles they're tough to get out. The larger the sheet, the harder it is to install.